As the autumnal equinox made its way to the western hemisphere, Symbiosis Gathering kicked off on the weekend of September 22nd to the 25th, celebrating our Earth's 45° degree tilt into a new season. 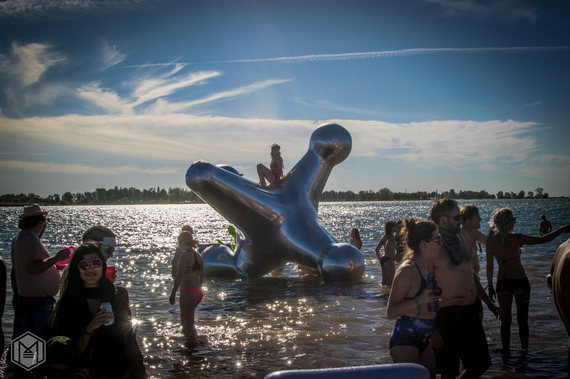 While many people in the world began pulling out their scarves and dusting off their rakes, the festival community was packing up their favorite costumes and swimsuits, some still with a fine layer of playa dust upon them, and heading to the Woodward Reservoir in Northern California to converge for a four day aquatic adventure. Spending its third year at this location, Symbiosis Gathering threw their last hoorah at Woodward Reservoir, and what a hoorah it was. Known for its expansive setup, the event was extremely spread out over miles of lumpy terrain. 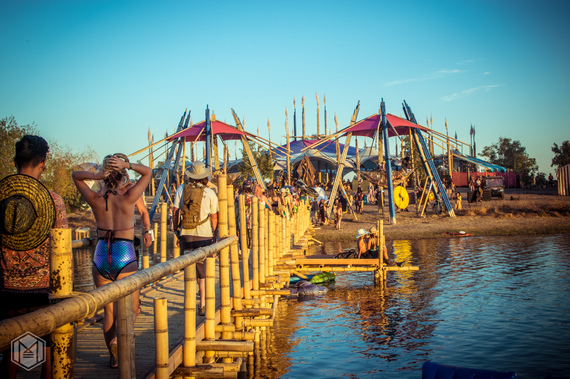 The vastness allowed for elaborate stages, smaller low-key stages, a Kidzbiosis area, epic art installations, as well as several movement and workshop structures. Symbiosis is by far the most grandiose gathering of California's festival season offering Burning Man-level installations and art boats alongside a high grade music festival lineup. Definitely its hugest year to date hosting over 15,000 attendees, one does not simply walk into Symbiosis Gathering. This being my third year, never had I experienced a 10 hour wait to enter the premises. The staff did the best they could to rearrange traffic and keep the flow going, but it did little. Rearranging a school of mackerel doesn't make much of a difference when they all have to swim down the same narrow passageway regardless of how they get there. The biggest priority was getting people off of the paved road so that local residents didn't end up stuck in the traffic. In that respect, the rearranging did help. Either way, those waiting in line seemed to accept their fate, happily playing frisbee, busting into their beer rations, and making new friends. 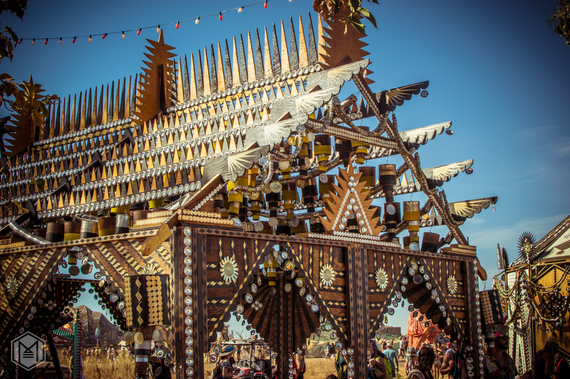 Logistically, any festival that promises the epic proportions that Symbiosis does will face certain challenges despite how well it is organized: long entry lines, deplorable port-o-potties, miles of walking, and sound ordinances. 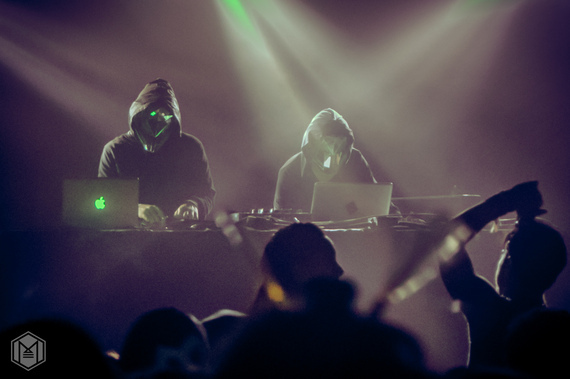 These were all large obstacles that the Symbiosis team faced, however, they are also obstacles that the seasoned festival-goer accepts without question. Most of us know what we are getting ourselves into when we make the decision to attend a music festival. If you want clean bathrooms, minimal walking, and instant gratification, then I'm assuming you are not the festival type. Challenges aside, Symbiosis Gathering is an indisputably beautiful event. The blue waters of the lake provided an ideal atmosphere to spend the hot, dry days. Floaties of all shapes, sizes, colors and species surrounded the Swimbiosis stage while art boats cruised from shore to shore. 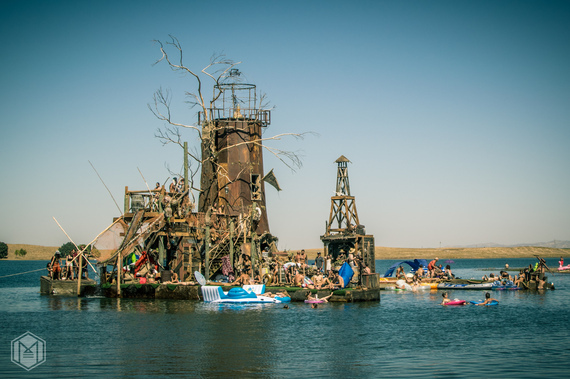 The DeLorean fan-boat made an appearance after having captivated the hearts of attendees at Symbiosis 2015 as well as several new art boats, like one that was themed after a carousel. There was so much to see and do that it was nearly impossible to see and do it all. With the stages being so far apart, it was easy to get sucked into one and remain there for hours at a time. It was also easy to get distracted by something magical whilst on your way to another stage. There were various art installations that were so small you'd most likely only see them once whilst others that were so big you could see them from afar. Symbiosis was a veritable buffet of the senses with so much stimulus that my plate was constantly overflowing and I couldn't help but go back for seconds, thirds and even fourths. I approached Symbiosis a little differently this year than the last two. Instead of chasing music and attempting to follow a schedule which often leads to disappointment, I decided that aimless wandering would be more fruitful. Though there were a few artists I was so excited to see and missed (Warpaint, Nicola Cruz, Hedflux), what I did see made up for what I didn't. As aimless as my wandering might have been, there were various destinations that I made it to, despite being a part of a large group that changed every night. However, when everyone is down to just cruise with no expectations, you discover more, rush less, and stop to smell the Palo Santo. With such a diverse lineup, Dirtwire, Santigold, Dimond Saints and Sun:Monx stand out the most in my mind's eye (and ear) in addition to the several other sets I stumbled in and out of, only catching a few minutes. 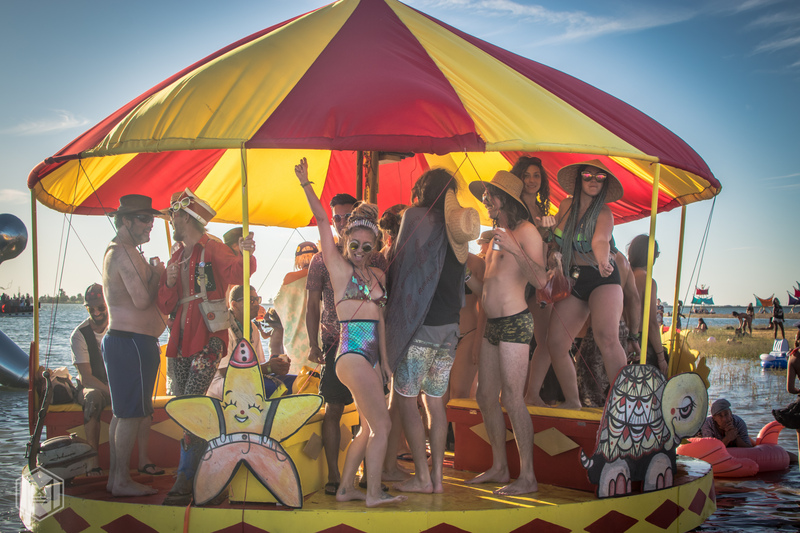 Sierra Carrère sang a beautiful birthday sunrise set on the Front Porch art car as onlookers sipped champagne while skinny dipping and chunky dunking along the shores. The Atoll, which was likened to its namesake, was complete with a DJ lineup and waterslide that blasted participants into the water like a shotgun. 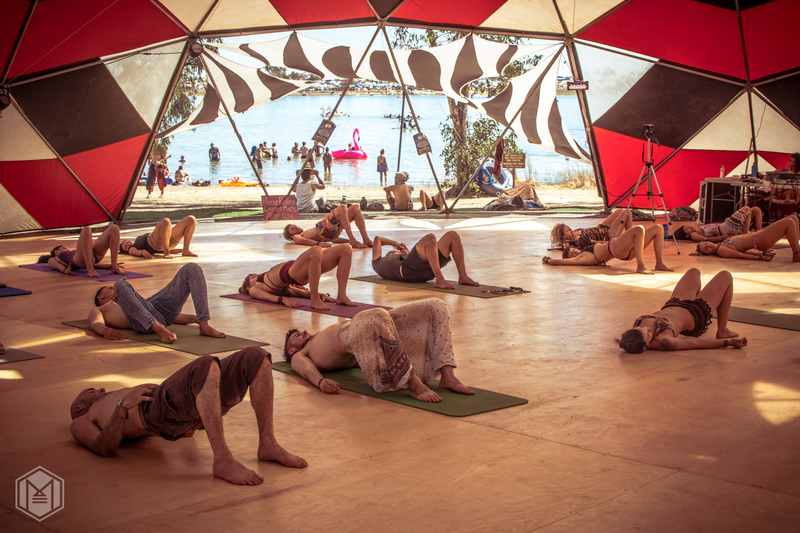 The pinnacle of what makes Symbiosis Gathering a transformational event is its offerings of educational workshops, lectures, and movement classes. One could learn about urban permaculture or psychedelic data science, participate in a money burning ceremony or Anasazi-style Yucca sandal making, take an acro-yoga class or improv workshop and even get some laughs in with JP Sears' satirical speakshop on "becoming ultra spiritual." These and the many other workshop contributors are what makes these events so powerful. 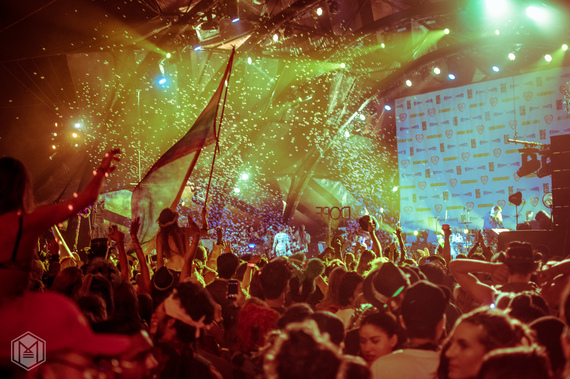 While partying, playing, and seeing live music are what sells tickets, it is the idea of bettering oneself through learning where the magic of transformational music festivals truly lies. Though this was its last year at the Woodward Reservoir in Oakdale, California, this is definitely not the end of Symbiosis Gathering. One of its most unique traits is that it changes locations, keeping the event in a perpetual state of evolution which preserves its intimacy while sharing it with other communities. It is also known for being organized around a celestial event and next year the festival will be celebrating a full solar eclipse which will take place in August of 2017 in Oregon. 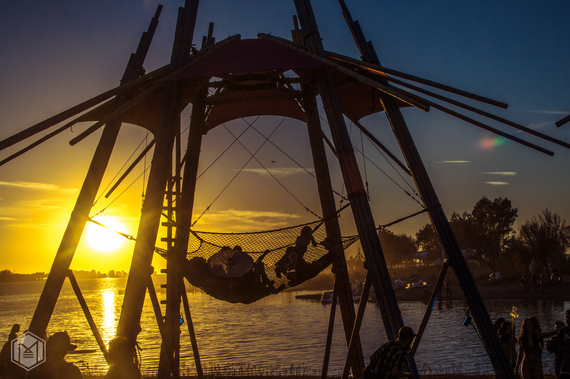 After growing so big that it was nearly bursting at the seams, Symbiosis bids California adieu (for now) and heads to a new landscape, continuing to use the cosmos as its guide.